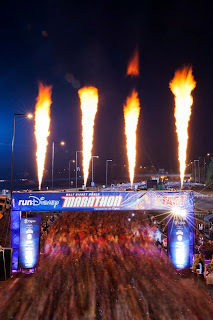 This is part of a series on my blog called, "My First Marathon". The concept is simple, write a post about your first marathon, a race recap, why you picked it, how training went, if you liked the race, etc. and I will post it on my blog. If you are interested in participating in the series you can email me at fromcouchtoironwoman@gmail.com. 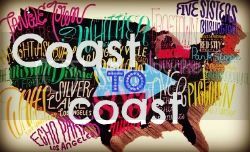 The fifth post in this series is from Abby at Back at Square Zero. I haven't had the pleasure of meeting Abby, yet, but I think we would be great friends! Abby's first marathon is very similar to my first marathon and we both knew that we wanted redemption after it was over. I am happy to say that Abby has since completed two more marathons and has the Rock 'n' Roll New Orleans Marathon coming up in February! 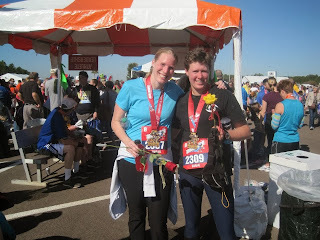 I had just run my first real half marathon with a friend and felt on top of the world. I came in under 2 hours, something I was not expecting and have not done in the almost 3 years since, and so the logical decision seemed clear - full marathon time. In hindsight it was a crazy decision made by two very excited girls on a runner's high as we walked back to the car post-race, but in the years since then many of my decisions have been made while basking in that same post race glow. My first marathon training cycle was tough, but exciting. Week after week I hit new personal distance records and reveled in what my body was capable of achieving. Day after day I wondered how it was possible to be that sore for that long. In hindsight it was probably my best training cycle to date - I hit all my training goals. I made it through every long run, got in great mid-week workouts, was running at a faster pace than I have since then, and most importantly… I was injury free. Everything looked perfect. I was right on track for the 4:30 finish I was aiming for. The weekend of the marathon was a blur. 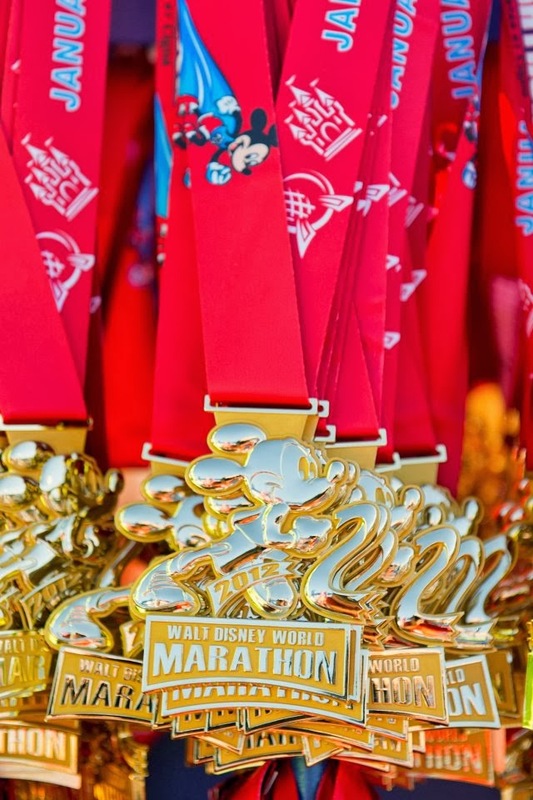 Packet pickup, time at Disney, trying to eat right and get some sleep when I was in such a ridiculous, energy filled environment seemed almost impossible. It was fun, but wild. Waking up at 3:00am and heading out before 4:00 to wait in lines, on shuttles, and in corrals was unbelievable, I got a sense of how big the Disney Marathon really was. We had our plan in place and stuck to it beautifully for the first 10 miles. Every mile was between 10:00-10:30 and while we enjoyed seeing all the characters and taking in the sights of Disney we didn't stop for any pictures, we were on a mission. 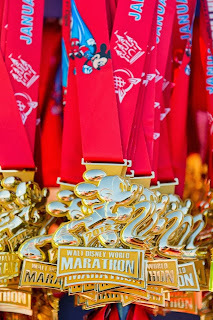 My running buddy and I ran without headphones so we could talk about it all - our favorite characters, what we would eat at each country in Epcot that night, rides we would ride, etc.. However, at mile 11 the stuff hit the fan. I was in extreme pain and between miles 11-15 my time dropped two minutes a mile. I was hobbling instead of running and struggling to stay under a 14 min mile pace. It took me two miles, but by mile 17 I had finally convinced my marathon training partner to go on and finish without me. It was devastating. I couldn't understand why all my long training runs had gone so well and this was going so horribly. I was miserable. I stretched. I walked for a few minutes. I stretched again. I tried to run, but a painful hobble was all I could manage. I pushed and clawed my way through those miles. I thought about how stupid the marathon was. What an idiotic race! Why would anyone want to do something that would cause them such pain? Why had I chosen something I could train so hard for, only to lose it all on the day it mattered most? I fought back tears. I swore never again. No more marathons for me. And then I saw the finish line. I ambled across. 5:13:31. Nowhere near the 4:30 I wanted, the 4:30 I had trained for, and the 4:30 I was on track for those first 10 miles. I was in so much pain. I limped toward the volunteers holding the medals and took mine. As I hobbled around looking for my running partner something changed. I began to realize not what a disappointment I was, but how I had still made it through even when every ounce of my body had wanted to quit. And right then, right there, basking in the post-race glow, the pain meant nothing, the time meant nothing, the accomplishment - that meant everything. It was at that moment I decided I needed a redo, a redemption race, and my journey towards the marathon continued. Great post, Abby! It's really cool to hear how your mindset changed back to realizing the amazingness that you accomplished! And all that you've accomplished since! A true inspiration! Thanks for sharing!